Posted on April 9, 2019 at 2:13 pm. The FIU Alumni Association is making a big move in 2021! 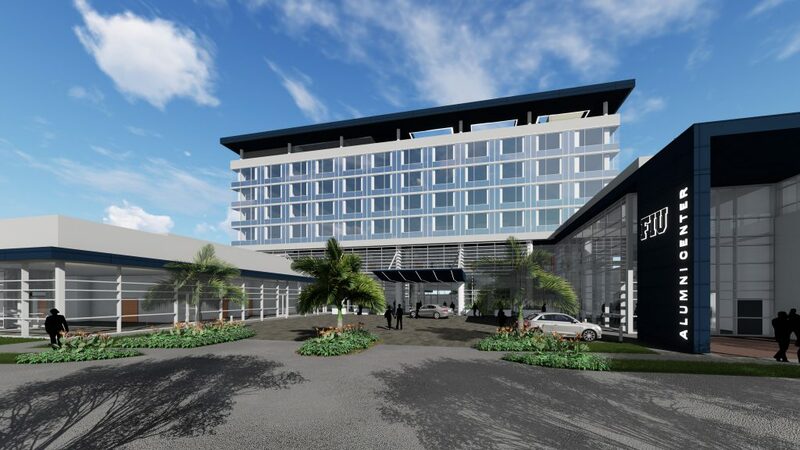 On March 28, 2019, the Florida Board of Governors approved a public-private partnership that will establish a combined alumni and conference center and hotel on the Modesto A. Maidique Campus. The facility, set to open in 2021 following an official groundbreaking in the end of 2019, will become the new home of the FIU Alumni Association. “The future FIU Alumni Center will be a welcoming beacon – a ‘home away from home’ – for alumni and community members who return to campus,” said Duane Wiles, executive director of the Alumni Association. With a globe-spanning alumni base topping 225,000, and an Alumni Relations & Annual Giving team that has nearly doubled in size in the last few years, the organization is outgrowing its current home in the MARC building at MMC. The new, 13,700-square-foot FIU Alumni Center would offer the organization much-needed space and the opportunity to continue to expand programming and services for alumni and students alike. Plans for the center include expanded career and professional development services for alumni, a collaborative environment to foster networking and mentorship among alumni and students, and a space for alumni interested in continuing their education. The facility is set to feature an indoor atrium, an outdoor covered patio, a large conference room, administrative offices, a library, an emeritus faculty lounge, a career and business center, student work space and more. It sit on approximately four acres of land near Hennington Island by Southwest 8th Street in the northwest quadrant of MMC. “Imagine all the things we could accomplish as an organization with a space that not only is significantly bigger than our current home, but that is the product of the dedication of our own alumni and fans of FIU,” Wiles said. The construction of the Alumni Center, which will coexist with a conference center and 150-bed hotel in the building, will be funded through philanthropic support of the Next Horizon campaign. Nearly 1,000 donors, including alumni, have already stepped up to show their support by making a donation to the Alumni Center Building Fund. If you would like to make a gift in support of your future FIU Alumni Center, please click here.